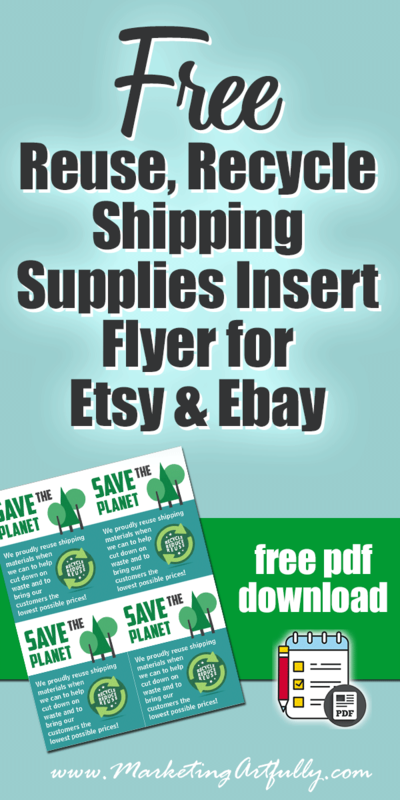 Reusing Shipping Supplies For Etsy or Ebay... Tacky or Cost Effective? 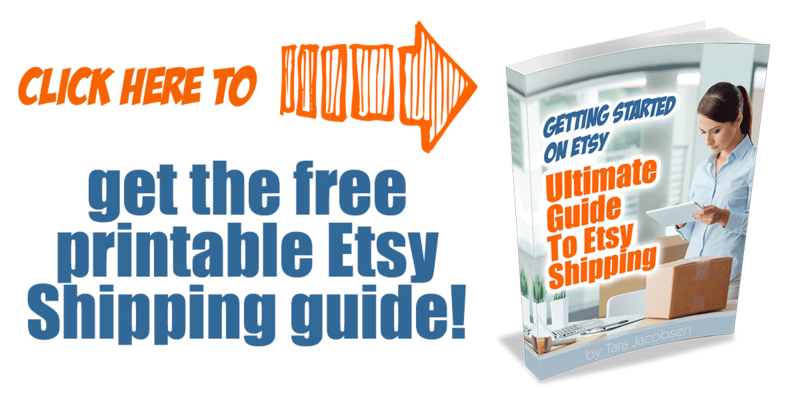 You are here: Home / Etsy Marketing / Reusing Shipping Supplies For Etsy or Ebay… Tacky or Cost Effective? 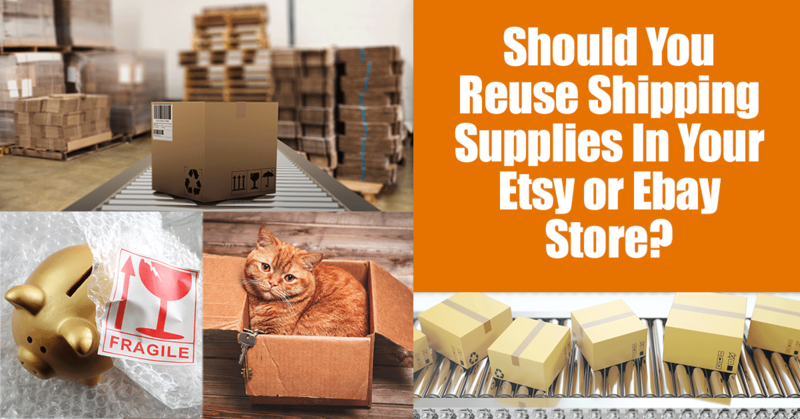 Reusing Shipping Supplies For Etsy or Ebay… Tacky or Cost Effective? 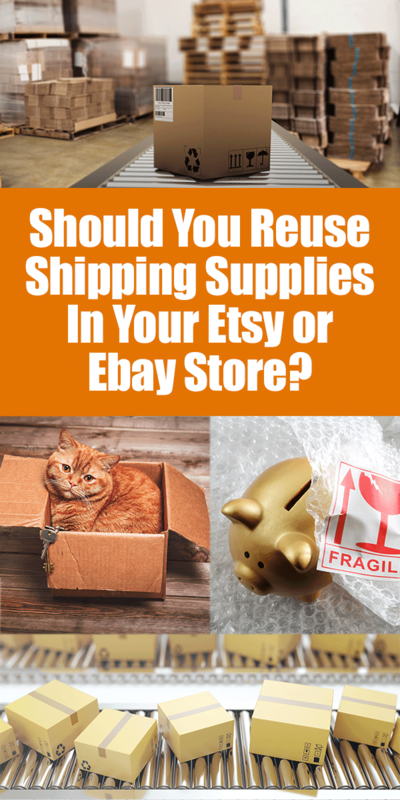 Today we are going to talk about reusing shipping supplies in your Etsy or Ebay store. By reuse I mean using a box you received to ship out an order or reusing those cool air pillows that you get in Amazon boxes. All thoughts are my own and you might have different opinions about some or all of it! 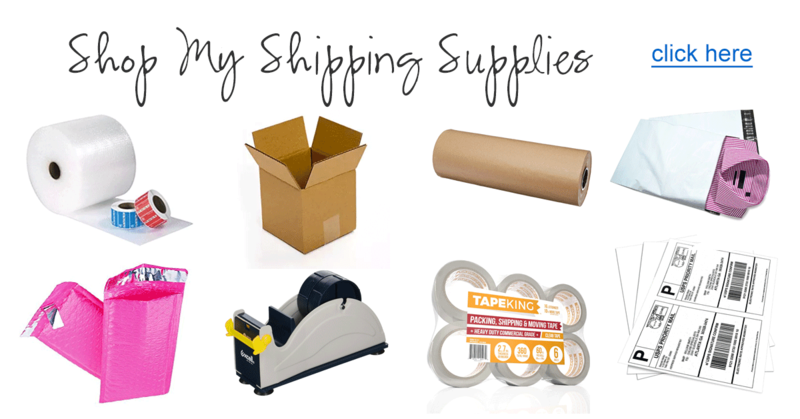 if you are super for scavenging all your shipping supplies, you may not like a bit of what I say and if you are for using all new materials it might make you a wee bit uncomfortable too. Either way, maybe stop and think about what you could or would feel comfortable doing! Saving Money! Let’s start with a really easy one that we can all understand, if not agree with. When you are starting out your only choice may be to use “recycled” boxes or packaging. You may not be able to afford to buy all of the different cool kinds of packaging that you want when you are more seasoned. Saving Time! That said, many of the things that I ship out need to go in larger or weird sized boxes. The boxes that our pool filters come in are the perfect size to ship tall, skinny statues in and I do use those! If I had to run out and buy every size box that I need to ship out I would make myself nuts and spend way more on shipping materials than necessary. I am a little tree-huggery and so reusing supplies when I can makes me happy! There is so much waste when you get a perfectly good box full of bubble wrap or air pillows and then just bag them up in another plastic bag and send them to the landfill. You all have gotten that Amazon order which held a tiny little thing in a giant box. Reusing that box is a great idea if it is in good working order (more about that later). Sometimes finding supplies to reuse is about keeping your eyes open for opportunity. My husband ordered lights for our patio and each one came wrapped in a tiny little bubble bag. I have been using those for months to be the first wrap on little pins I send out. Great to keep my item safe in shipping, I didn’t have to buy them and they got a second life! Okay, now that we have gone over the good things, let’s talk about the not-so-good things! Non Shipping Supplies. One time I heard a seller who I really respect say that she shipped her shoes out wrapped in a plastic bag from the grocery store. I have heard horror stories about people getting items in cereal boxes or diaper boxes. All of these were never intended to be shipping materials so I would not use them. When I am talking recycling shipping supplies I mean using items whose original intent was commercial shipping. Broken Boxes. It is important to understand how cardboard works as a shipping material . Double walled cardboard is the kind that has an outer piece, squiggles in the middle and then an inner piece. The way this helps protect your item during shipping is that middle and outside “give way” on themselves rather than letting the force of an impact hit your product. If your box is already broken, you don’t have that same kind of protection. Dented Boxes. 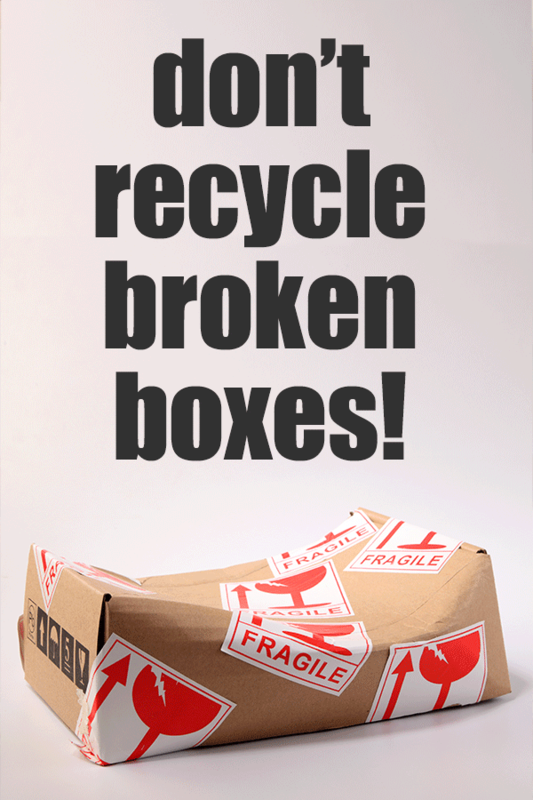 Another way that cardboard works to protect your products is by having a sturdy shape. The tall corners help to make the items secure and keep other boxes stacked on top of it from crushing. If one of your corners is dented you have lost some of that protection and maybe don’t use that box for shipping something fragile. Bubblewrap. Bubble wrap works by having a whole bunch of little “air pillows” all in a row and layered to keep things from breaking under impact. Each time an item pushes against a piece of bubble wrap and that pillow breaks, the cushioning effect decreases. Only reuse bubble wrap if the majority of the bubbles are still “puffy” otherwise you are just wrapping your products in a plastic sheet with no protection. So now we are down to why I wrote this post. Yesterday I sent out a reused box that was the perfect size and in great condition to a lady Canada. Now understand, I do this frequently and have never had a bad review or even an email complaining about reusing a box, but since I had to put some plain white stickers over previous labels I started to feel a little funky. Would she even notice? If she noticed would she think I was cheap or just a good citizen of the planet? Was there a way to make it appear deliberate and thoughtful rather than just like I found a box in my laundry room and stuck her label on it! Bingo! This one got me thinking! This is the first one that I thought of! I did a bit of searching around Etsy and found this set of stickers from HousesofHays that says, “We Proudly Reuse Materials For Shipping”. That seems to be something that I could get behind! Some of the other stickers were a wee bit more apologetic about it, with sayings like, “Pardon our packaging” or “Our boxes may be ugly…”. 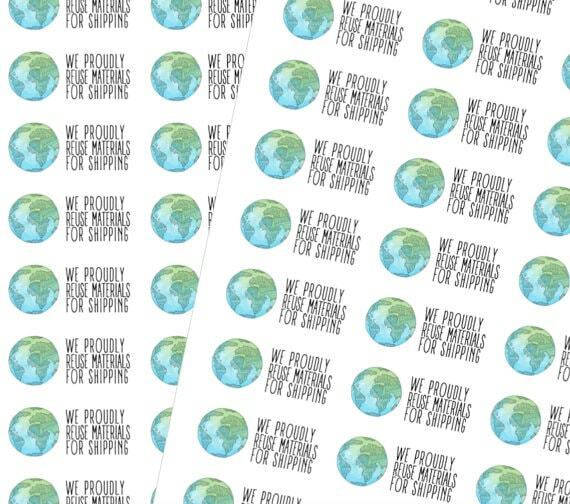 Both of these kinds of sayings/stickers would make me feel like I was doing something TO the buyer rather than something FOR the planet and my business. 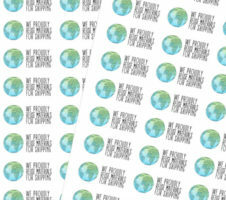 So then I thought, why not do a little little sheet that I could put into packages that I shipped in reused boxes! I personally print all my collateral in black and white on colored paper (I have a black laser printer) but you could print these out on your color printer too! I filled the box with brown clean fill paper (new) and then filled the top with big bubble air pillows (recycled). And last but not least, here is the outgoing box. 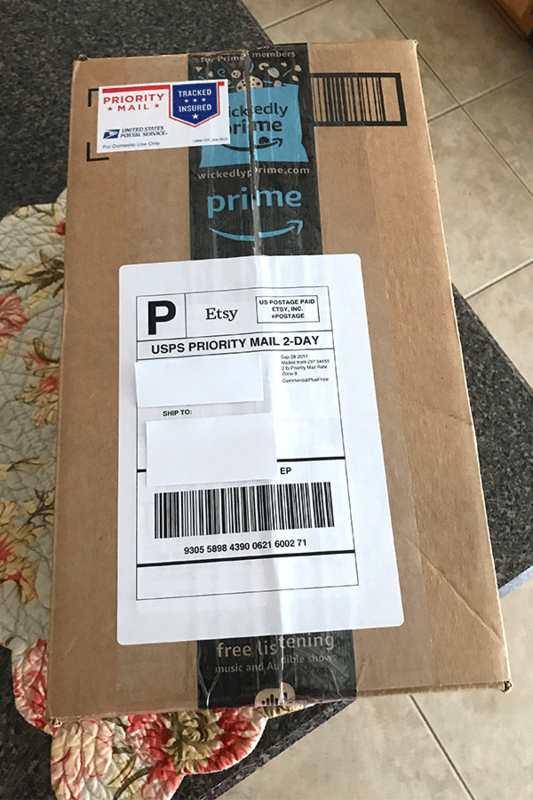 I can tell it is a “used” Amazon box and because it is not a Priority Mail box I put my stickers on it, but no one else should be able to tell the difference! I couldn’t use a priority mail box because all the sizes were weird except the Regional Rate B boxes and since I was shipping from Florida to California that would have made it prohibitively expensive to ship! Now that you are down here I think you can tell that I am generally a “reuse, recycle” kind of Etsy and Ebay seller… with a HUGE disclaimer. I think you should only use packaging that delights your customer and makes them happy to have received your package. 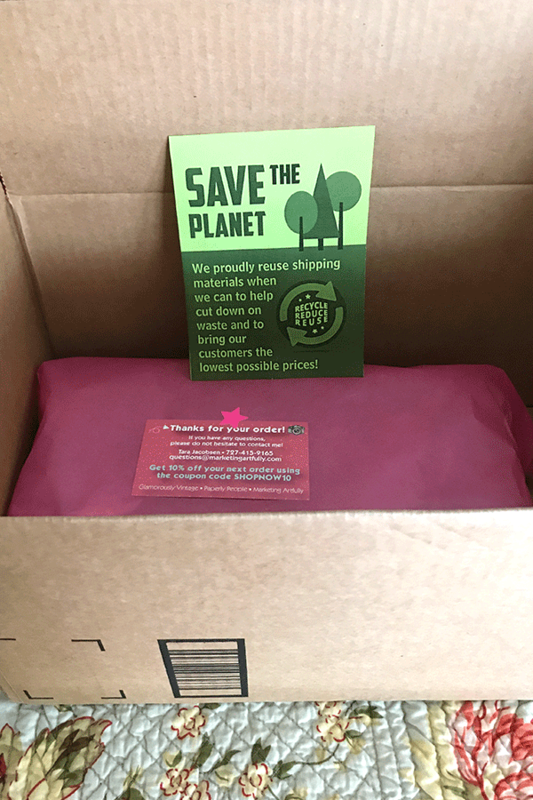 Use some of the money you save on boxes to buy “thank you” cards or fun pink tissue paper. Make your packaging pretty so that when they open the box they get a feeling that you put a bit of thought into your work! 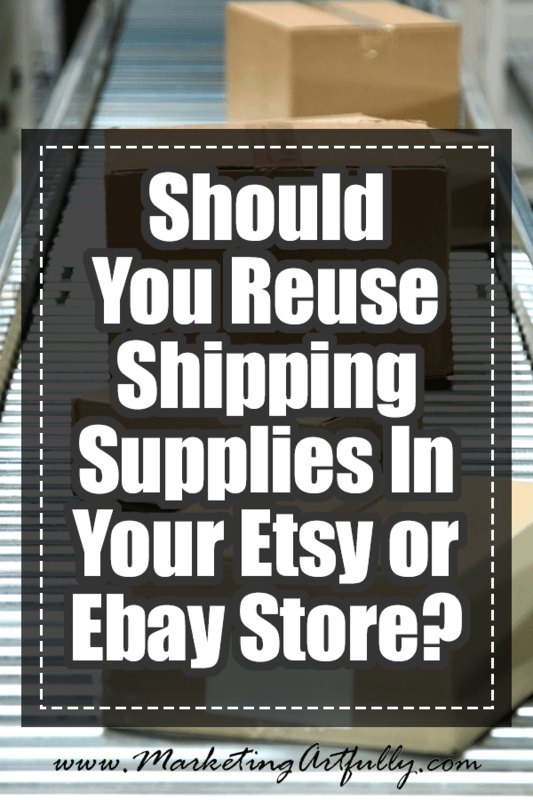 It is fine to reuse shipping supplies if you do it thoughtfully and make sure that you are always keeping your customer in mind!